Looking for something extra special for that extra special someone this Valentine’s Day? Tired of diamonds, flowers, stuffed animals, and chocolates (all undoubtedly dug up, grown, manufactured, and mixed up in lands far far away)? 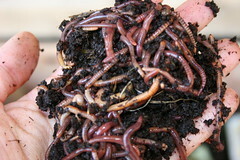 Why not reduce your carbon footprint and pick up a pound of Super Composting Red Wigglers for Valentine’s day? They’re red, so they’ll make a perfect Valentine, and they’re local (if you live in Bend). Although they’re not as sparkly, pretty, cuddly, or tasty as your typical Valentine’s Day gift items, the gift of Red Wigglers just shows that you really do care about her/him and the world we all live in. ;^) Visit Wonderworman.com today! Wonder Worman loves these red wiggling creatures. I created her marketing components including the smiley Red Wiggler logo. Harold O Cecil (aka Ad HOC) helped a bunch w/ making The Wonder Worman come to life via copywriting and PR efforts. Worms. I remember fishing w/ worms when I was a kid. They must have been tasty because fish sure did like them. It was always fun going to the bait shop for a styrofoam cup-o-worms (Night Crawlers actually). They were always in the cooler behind the counter. Little did I know they had a close cousin whose ‘pooping’ ability would one day make headlines around the world. Red Wigglers – the super composting worm. They are the cornerstone of some villages. 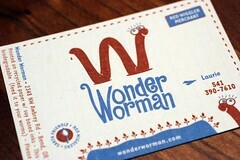 I’ve been learning quite a bit about Red Wigglers as my wife is “The Wonder Worman” – Invisible car yet to come. ;^) Although slimy, they are quite cool to look at and hold.We are finishing up her site which is launching this week, so I thought it would be cool to post a photo of these cool little creatures.